Want to take a unique China Yangtze cruise tour, but none of our pre-designed China tour packages delights you? Then design the one you want NOW! China Discovery can do anything for you, and we have always been trying to provide our travelers with high quality services and valuable trips. Just take a few minutes to fill out the inquiry form below, and our travel experts will create the best itinerary with estimated tour cost for within 0.5~23.5 hours! 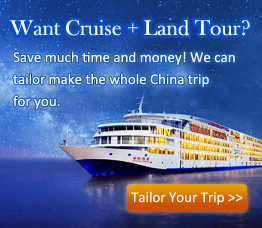 What are other cities to be included in your Yangtze cruise tour package?